My Favorite Cowboy by Donna Grant will appeal to all animal lovers, especially those of horses. The plot was addictive. Instantly, I was taken into the mystery of several horses becoming ill. No one knows why, how, who, or what is causing the problem. But the veterinarian, Audrey, is determined to find the answers. Her heart is made of gold. It proved difficult to not take her side or like her as a character. She made me want to dig further into the book. Then, there’s this tough as hell cowboy, Caleb. He has military background and the looks to make every woman swoon. There is his steel outlook that could drive away most men from him. But he too, has a good heart. He stepped up to battle and despite his mixed feelings for Audrey, helps with the case. Sparks fly, and danger mixes to create a wild thrill ride. 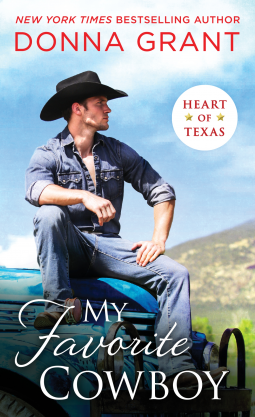 Overall, I enjoyed reading this romantic cowboy novel. A little suspense and heat that made an unforgettable journey. I recommend My Favorite Cowboy to all readers.